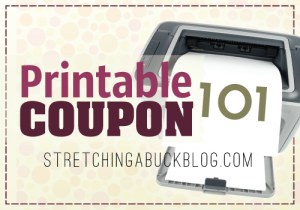 View my most recent Printable Coupon posts here. Note: Each printable coupon is assigned a unique serial number. Your IP address and other information about your printing and coupon redemption habits is recorded on these coupons. If you attempt to make photo copies of these coupons you will get caught. Companies could block your IP address or take legal action, so please don’t do this! This particular coupon is configured to work for people using Internet Explorer. You can tell this by looking at the “vi” above in the URL (sometimes a “wi”). To make this link work for someone using Firefox as their browser, simply change the “vi” or “wi” to “vg” or “wg” and you should be able to print the coupon. If you use Safari, word has it that if you change the “vi”, “vg”, “wi” or “wg” to “xs” that the coupons should print. 2) If you experience issues printing coupons on Smartsource.com, it could be due to a variety of reasons. You can find a helpful Troubleshooting Guide for Smartsource.com here.